Troy Tulowitzki’s hitting streak is drawing attention from fantasy owners seeking help at shortstop. Well, I took a peak at my teams, and at the free agents in my leagues. I see some big names, but then I see low stats by those names. Do I grab them or wait? Reach, or hold what I have? Well, that’s the point of this column and if I can’t answer my own questions, I am in some trouble! So, read on to see what I decided. 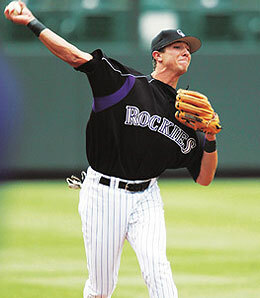 SS Troy Tulowitzki, COL — With the Rockies playing every day from Monday to Sunday next week, Tulowitzki (No. 13 on our top 30 prospects this spring) could be a good shortstop replacement if you need one. He hasn’t been lighting it up stats wise, but he is on a seven-game hitting streak and is batting 12-for-31 (.387 BA), with two HRs, eight RBI, and a triple over this stretch. Don’t drop someone good for him, but if you need a DL replacement, give him a look as he is the Rox starter at short. SP Fausto Carmona, CLE — Well, I’ve been reading all over the place that SP Jake Westbrook (abdomen) appears headed for the 15-day disabled list. Therefore, Carmona will be recalled to take the hill for Monday’s game. It’s not that I think he will toss a no-no, but if you need a start or two next week, he looks like a good bet pitching against the 12-16 Orioles. SP Mark Hendrickson, LAD — All I am going to say is that if he is still available in your league and you still haven’t grabbed him, you need to stop reading this right now and go read about knitting or something on some other web site. The guy has a crazy ratio of 4.55 hits per nine innings, is fanning 7.8 K/9, and a 1.30 ERA to go along with his 0.69 WHIP. Grab him while he is hot. Who knows how long it will last based on his awful 2006 season. This entry was posted on Saturday, May 5th, 2007 at 2:52 pm	and is filed under BASEBALL, James Morris, The Wire Troll. You can follow any responses to this entry through the RSS 2.0 feed. Both comments and pings are currently closed. Clemens signs with the Yankees… grab him if he is available now. Hey, what can we say, Monica? We like to go for the creep factor around here. Sorry your boy is injured now. I guess you’re stuck rooting for someone else.